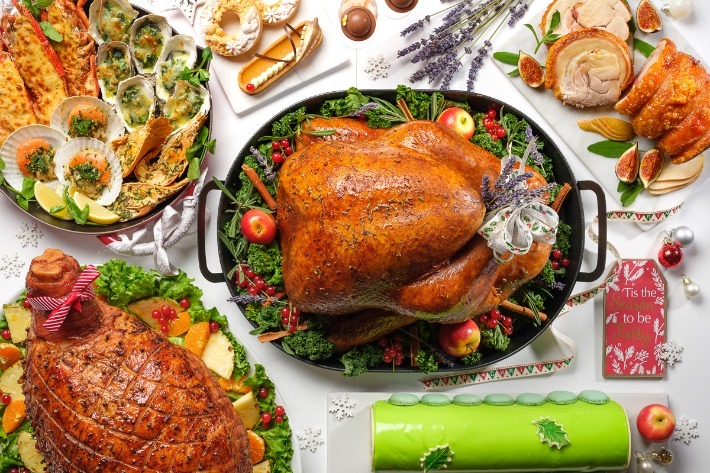 The festive Yuletide is soon upon us and with it, hotels and restaurants all over Singapore are pulling out all the stops, innovating and crafting stellar menus that aim to astound and make every diner’s Christmas feast a memorable and jolly one. This festive season, The Square Restaurant over at Novotel Singapore Clarke Quay will feature a splendid buffet line-up which will not only include an array of stellar wintertime roasts, such as gammon ham, roasted turkey and roasted beef strip loin, but also Asian favourites as well and a huge selection of sweet treats that will please even the most discerning sweet tooth. If you have been an avid follower, you would know that being merry does not stop at good food. From 1st until 31st December 2018, our readers may quote ‘ladyironchef20′ to enjoy 20% off this very festive buffet spread—which means that you get to feast all the same, but at a much more value-for-money price! Here are some of the highlights you can expect at the Festive Buffet over at The Square Restaurant. Christmas is definitely one of the best times to make merry with friends and family alike, and a scrumptious spread of a feast is something you absolutely cannot do without. The time has come, once again, for the busiest yet most joyful period of the year! The holiday season is just around the corner, and we are sure that everyone is busy scrambling over presents, party arrangements as well as making Christmas dinner plans. Are you racking your brains over where to have your Christmas dinner with your loved ones? 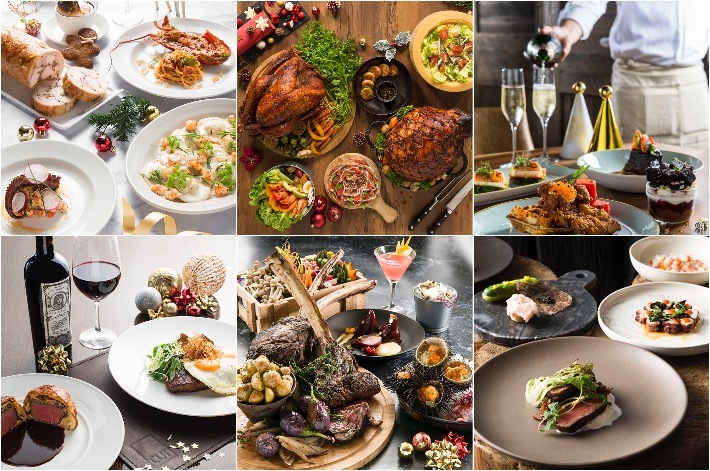 This year, Novotel Singapore on Stevens and Mercure Singapore on Stevens are pulling out all the stops to offer a series of dining options for the annual year-end celebrations from November to December 2018 to create a memorable Christmas for everyone. Located on level 2 of the relatively new hotel is Food Exchange. 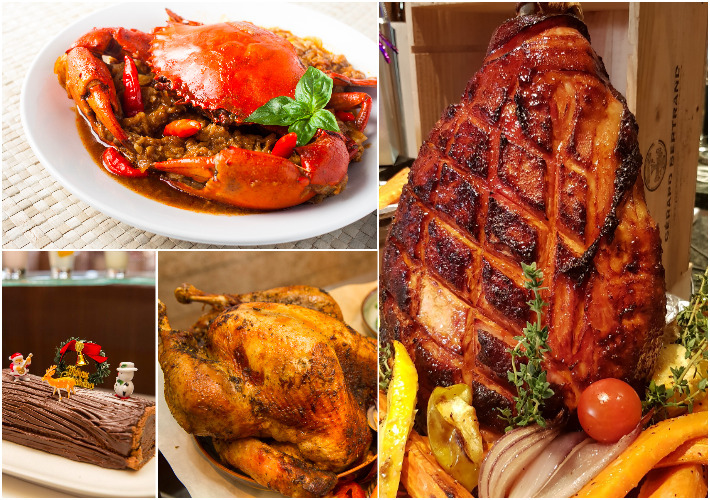 Treat yourselves to their daily lunch buffet starting from $42++ and daily dinner buffet starting from S$68++ per adult, while Fudebar’s Festive Takeaways offers free delivery for orders above S$200, if not otherwise is only S$30 regardless of location. To make this Christmas even sweeter, book before 14 December 2018 to enjoy 25% Early Bird Discount off Buffet at Food Exchange. Festive seasons are always the best excuse to go for an indulgent treat with your loved ones because that is when restaurants curate seasonal menus to celebrate the best of the season’s offering. 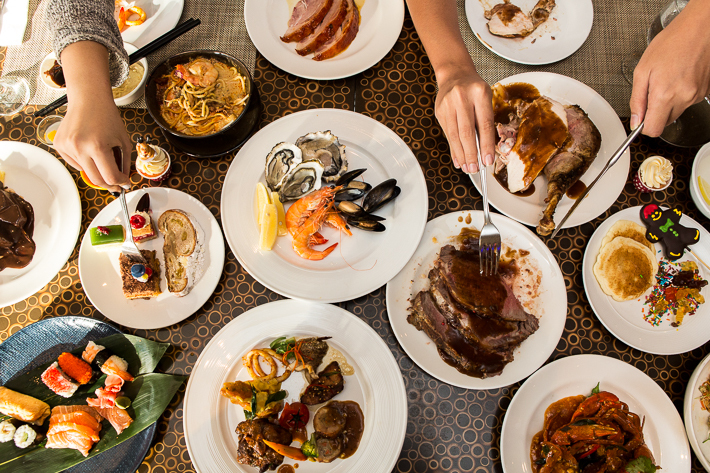 Featuring a multitude of expert culinary offerings and feasts fit for all kinds of celebrations, Marina Bay Sands is ushering in this festive season with a diverse spread of cuisines from more than 10 signature restaurants. Now when it comes to gourmet dining at Marina Bay Sands, you can be sure of fine food, excellent wine and without a doubt, plenty of festive cheer! This Christmas, look forward to a host of exciting gastronomic experiences at these award-winning dining establishments. PARKROYAL on Kitchener Road goes green with merriment this holiday season, adorning its halls with handcrafted Christmas ornaments made from 100% recycled and repurposed materials, whilst whipping up an impressive array of Yuletide delights to savour with your loved ones. Spice Brasserie at PARKROYAL on Kitchener Road is one such buffet restaurant where you can expect to find a whole host of local and regional favourites as well as Yuletide classics with a touch of Asian flair. More than just crabs, allow Executive Chef Kelvin Chuah to dazzle you with an array of choices featuring his innovative rendition of Christmas turkey that features tandoori as its primary flavour component. At Spice Brasserie, festivities begin on 18 December 2017 with a full spread of seasonal fare to be enjoyed including Holland mussels served on ice, roasted prime beef with black pepper and mushroom sauce, as well as a bone-in gammon ham that is sure to make an impression. Takeaway orders are available until 31 December 2017. Quote ladyironchef upon making your reservations to enjoy 20% discount (minimum of 2 persons and maximum of 10 persons per booking) for the buffet, with 1 complimentary Wine or Beer (soft drinks for those under 18 years old). This promotion is not applicable for the blackout dates on 24 and 25 Dec 2017.